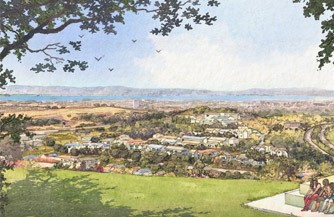 When completed, the Oak Knoll community will be home to charming neighborhoods, engaging open spaces and inviting public parks, giving residents the chance to enjoy the Oakland Hills and all this special place has to offer. 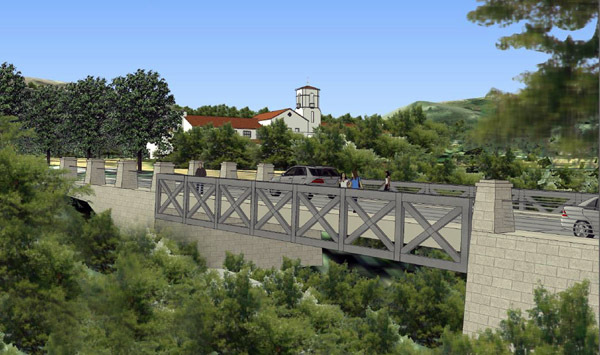 From access to the East Bay Regional Park System to integrated community focused trails, Oak Knoll will provide its residents and the public with walkable trails that will flank a revived creek, and will welcome families, runners, cyclists, hikers, dog walkers and naturalists. With the community situated in Oakland's southern foothills, abundant pathways and open space will connect family oriented neighborhoods enclaves with a community focused life-style center including amenities such as shops, restaurants and public meeting spaces. With the feel and character of neighborhoods such as Piedmont, Montclair and Claremont, Oak Knoll will be a vibrant community with a laid-back feel and small town atmosphere. 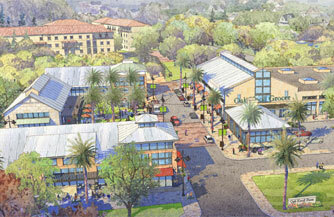 With the development of 918 new homes surrounded by parks and opens space, the planning and design of Oak Knoll draws its inspiration from the surrounding high-quality residential communities designed by renowned historic figures such as Julia Morgan, Bernard Maybeck, Walter Ratcliff, Frederick Law Olmsted, and the partnership of Mason McDuffie. Along with prominent housing and business development, the community will provide striking views of the surrounding foothills and the Bay Area's breathtaking vistas. By blending history with innovation, Oak Knoll will provide a unique setting for the growth of livable, sustainable, and attractive neighborhoods. After the attack on Pearl Harbor on December 7, 1941 the United States Navy realized that existing medical facilities on the west coast could not meet the demand WWII would create. To help solve this problem, the Oak Knoll Golf Course was chosen as an ideal location for a new naval hospital to help treat wounded soldiers. At that time medical facilities were quickly built to provide care for veterans returning from war. This was done at the expense of the natural environment and included covering portions of the creek traversing the property. Through the public meeting process and consultation with the community and surrounding neighborhoods, SunCal plans to uncover and restore the natural creek that once flowed through this property to its original state, and will expand its access by creating an adjacent trail. Outdoor enthusiasts and residents will enjoy the new shaded walkways, cycling and running paths that will flank the restored creek. World-renowned land planning firm Hart Howerton has been contracted to design a truly unique and sought after community. The 187-acre Oak Knoll community will feature a variety of home styles, built to cater to residents at all stages of life. Oak Knoll will include estate homes on the ridge, single-family homes and townhomes – all built to the highest quality and controlled by architectural and landscape design guidelines. Hart Howerton has successfully executed numerous community design and land-planning projects imbedded in existing communities in and around the Bay Area. Over the past 20 yrs, they have been the lead Planner and Architect for the Santa Lucia Preserve, a 20,000 acre conservation based community south of Carmel Valley. More recently, they have designed infill housing and community facilities for Spirit Rock and San Francisco Theological Seminary in Marin County. SunCal understands the conveniences of living in an urban area while still having easy access to outdoor activities; the Oak Knoll community will be designed to provide both. 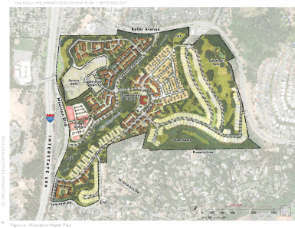 Nearly one-third of the Oak Knoll community property will be preserved as public open space linked through a series of trails, designed to flow with preserved and manufactured native and natural landscaping, flowers, grasses and shrubs, and aligning with the restoration and conservation of the riparian corridor. With approximately four miles of hiking and biking trails, homeowners will be able to enjoy the natural open space just steps from their front door. 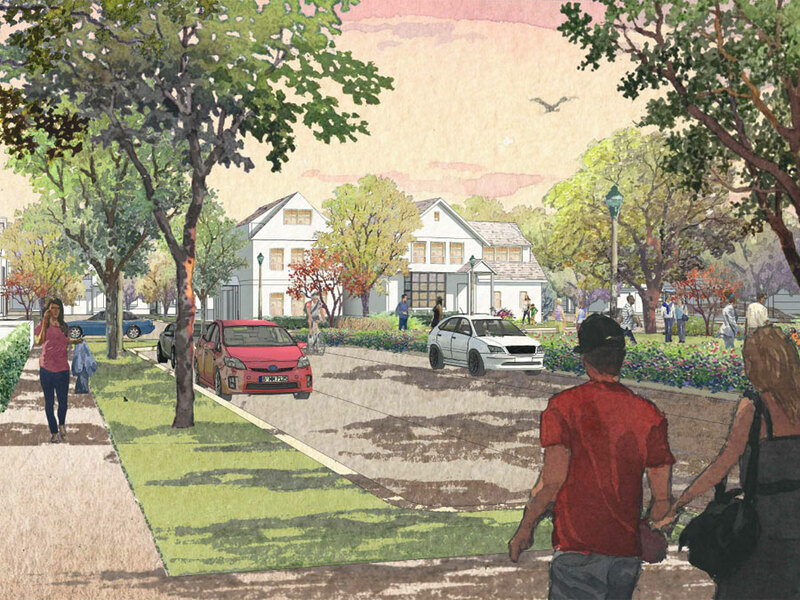 The pedestrian friendly walking community will have pathways that connect homes with the lifestyle center, parks and the Leona Regional Open Space; part of the East Bay Regional Parks system. Club Knoll is badly deteriorated from years of vandalism and neglect, and as a result of two studies we commissioned, we believed it was beyond rehabilitating and of limited historic value. However, after our conversations with the City and the dOakland Heritage Alliance, we carefully reviewed the structure’s condition and studied ways to preserve it. We now plan to integrate it into Oak Knoll so that it will one day return to service as a community center. A community center would be available for events for residents as well as the general public. The center would be at the heart of the community and offer space for all community members to use for events such as birthday parties, weddings and social gatherings. To pay tribute to the entire Oak Knoll Naval Hospital, veterans groups and all those connected to the facility’s long history, SunCal desires to construct a Monument Park that will be a place for quiet contemplation and reflection to honor those who served at Oak Knoll and for our country. In addition to the Oak Knoll Community Center, the proposed lifestyle center will encompass approximately 72,000 square feet of retail space that will serve Oak Knoll community residents and the nearby local community. 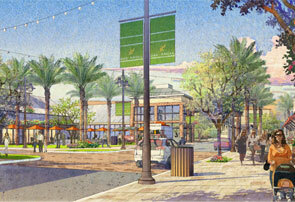 The Center will provide retail specialty shops and restaurants, as well as the daily needs. 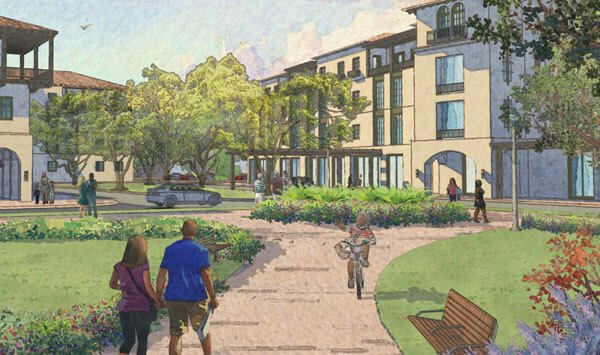 The planned lifestyle center will serve Oak Knoll and create a focal point for neighbors to relax and mingle outdoors. 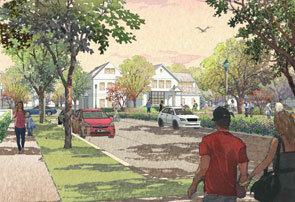 A plaza and village green will provide space for seasonal activities for children and families to gather. 8,000 New native trees are coming to Oak Knoll! Under City permit, SunCal will be removing 3,503 trees from the property, more than half of which are non-native trees or in poor or extremely poor health. The City of Oakland and the Fire Department view that clearing eucalyptus trees and other non-native plants will help to deter another deadly firestorm like the one that whipped through the hills in 1991. 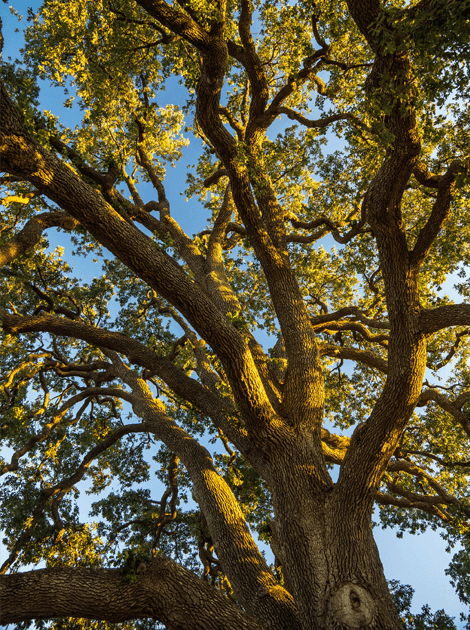 But trees are an integral part of the Oak Knoll development plan, and that’s why we’re committed to a program of planting native, non-invasive trees in our community. Since 2015, we have been working with a team of ISA-certified arborists to actually inventory and assess the condition of trees within the project area in accordance with the Oakland Tree Protection Ordinance. That means we had a team of people literally counting every tree above six inches in diameter. As it turns out, there are more than 7,000 trees on the property, and when we are finished with the project, there will be more than 11,000 – an increase of more than 50%. It has long been our goal to create a master development that integrates that natural environment with the community. Preservation has been a consistent theme and our plan does exactly that. In working to restore the site, for every tree that is removed we will be planting more than two more. That’s over 8,300 new native trees across more than 40 acres of the project area. Native trees on the property are predominantly Coast Live Oak but also include Bay Laurel and Willow among a few other species. Removing non-native trees and trees in poor health and replacing them with native trees is only one piece of our broader restoration effort. The project also calls for the addition of native flowers, grasses and shrubs, restoration of the entire Rifle Range Creek (which is largely under concrete today) and doubling the amount of riparian woodlands from 7 acres to 16 acres to support local wildlife. In addition, the arborists identified a group of grand oak specimen trees that will be moved to live a full life either on- or off-site of the property. In addition, we have been in discussions with a tree company to salvage many viable trees for relocation. When the project is complete, there will be more trees on site than when the property was originally purchased from the Federal government in 2006. 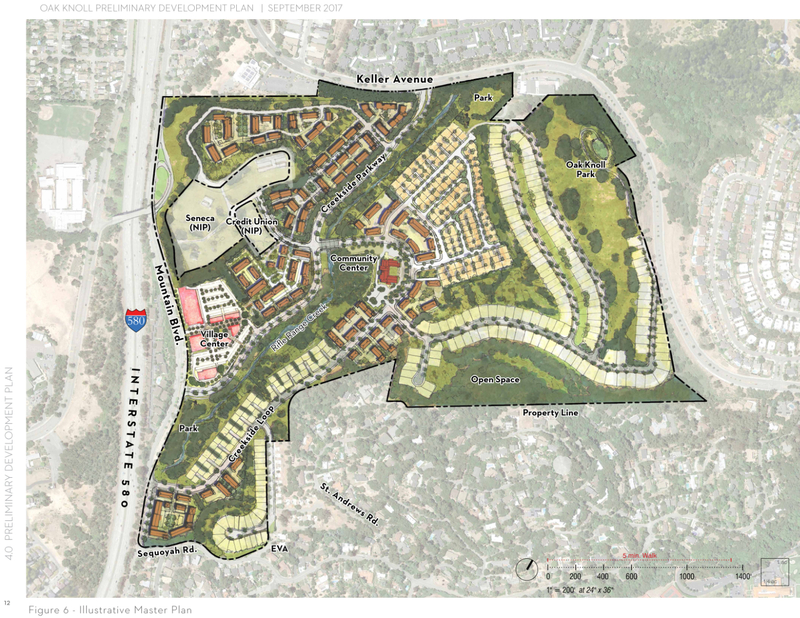 The Oak Knoll Community plan also sets aside nearly 50% of the entire 183 acres as public open space and parks linked through a series of trails designed to flow with the many preserved and newly planted native trees. The result will be a far more accessible place for the public to enjoy trees and the outdoors.